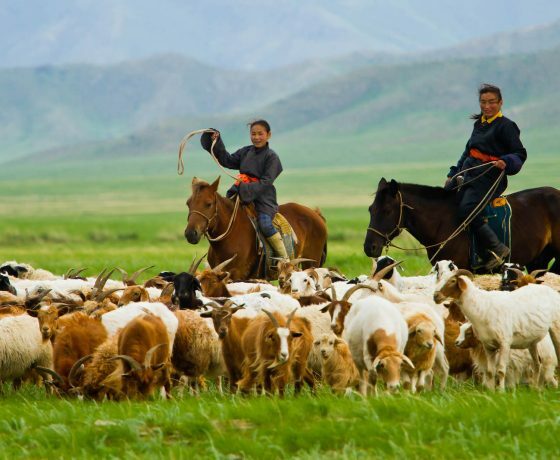 Mongolia is a vast landscape of steppes, deserts and grassy plains occupied by followers of the nomadic lifestyle– a tradition dating back to the days of Genghis Kahn and the Mongolian Empire. This country of reindeer herders, eagle hunters and skilled archers keeps ancient traditions alive with their boisterous, annual Naadam Festivals. Enjoy remote scenery and Mongolian hospitality, view exquisite art and antiquity, and revel in this spectacular, untamed country. Join in the festivities at the Naadam Festival in Karakorum. Mingle with hundreds who gather for archery, wrestling, horse-racing and people watching. This is a photographer’s dream trip! Stay in a comfortable ger (tent) camp and immerse yourself in the diverse wilderness, mountain and desert regions of remote Mongolia. These yurts are a reminder of Mongolia’s nomadic tradition, which its residents maintain to this day. Kayak on spectacular Lake Hovsgol, the “Dark Pearl” of Mongolia, which is surrounded by 9,000-foot peaks in an untouched setting of forest; mountains, and meadows where wildflowers abound. Hunt for dinosaur eggs under the Flaming Cliffs of the South Gobi Desert. This isolated area is home to a countless number of relics from the Bronze Age and is a treasure-trove for paleontologists.